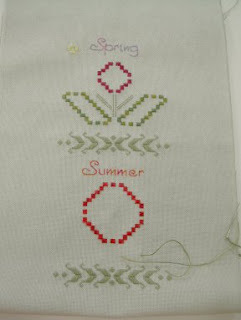 Well here is the update on my 4 Seasons bell pull, I have stitched Spring and nearly finished Summer, with only minor changes. Autumn is next, hope to start this afternoon, my stitching and blogging seem to come in spurts, with boring things like book work and cleaning in between. 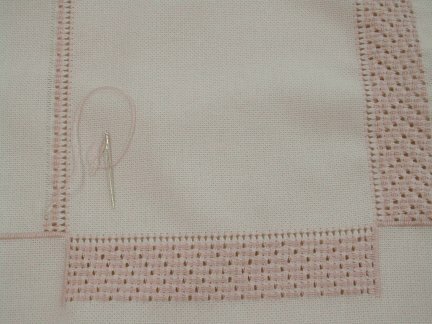 One of our customers once said "It must be great to do nothing but stitch" what a joke. Also an update on the Phone pockets, I have just finished the first set of notes and am working on the second set, more about that soon. Well here is the update picture, the middle of the flowers and leaves will have needle weaving in them when the piece is finished, but I am leaving that till last. 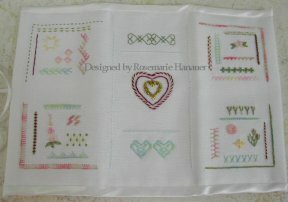 We have just received our copy of Embroidery and Cross stitch issue 19_3. 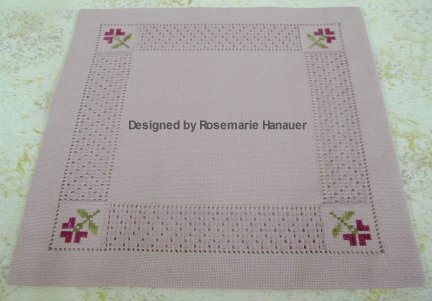 On page 28 there are instructions for a Stitch Sampler Hussif worked in Primke threads, unfortunately the instructions are incomplete with only graphs for 2 of the 4 corners being published. Also there are photos of only 3 of the 4 corners, and step by step instructions for 2 of the corners and the back. We did send the whole instructions to the magazine and as we do not get to proof read before they go to print, the first we know of any problems is when we get the magazine. 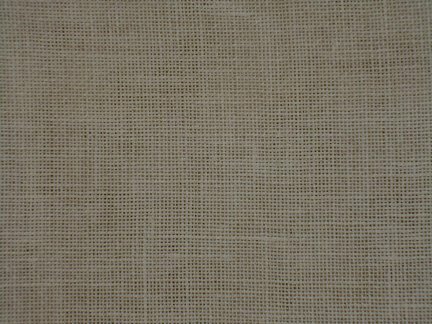 As they chose to only show a photo of the inside of the Hussif, I have posted the photo of the outside. 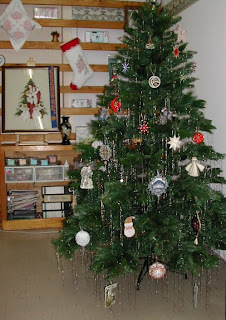 I thought I would share with you Monika's latest project, she thought that there were not enough projects out there for the men in our lives. 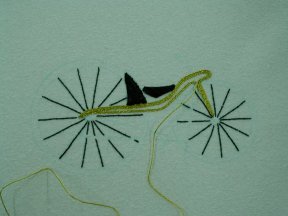 So she found this drawing of one of the very early bicycles and decided that gold work was the best way of stitching it. As you can see it is only in the early stages but I will keep posting up dates as it grows. And as an aside the First stage of the Tour Downunder will be starting just 5 minuets down the road from our shop in January 2012. So if you are a cycling fan and are in Adelaide, come and see us before the race. I have decided to start a 4 Seasons Bell pull, our new Primke hand-dyed fabrics inspired me. There is a lovely Dried Sage colour that Monika has dyed for me in Lugano. 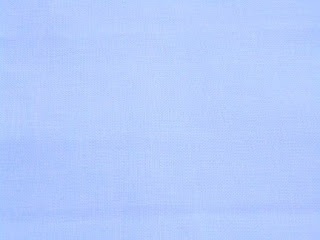 I have finished designing it on the computer and have picked the colours I think will work, so now it is just a matter of starting. Stay tuned and I will post a picture as soon as there is anything to see. 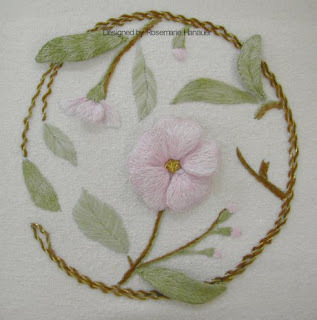 I am running another Cyber class for the Embroiderers' Guild of South Australia, this time it is a Beginner's Crewel Embroidery workshop. 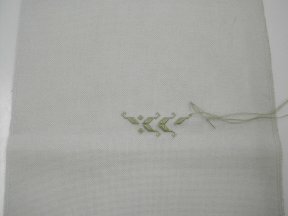 If you have always wanted to try Traditional Crewel Embroidery but did not have the time to go to a class this could be for you. 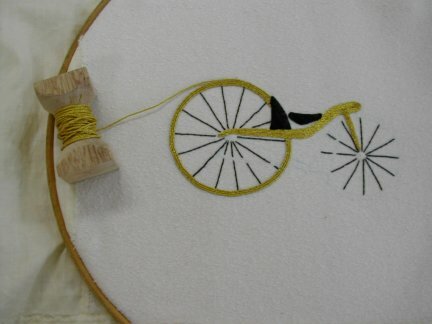 The class runs over 8 weeks and takes you step by step thru a range of crewel stitches and of course you can ask lots of questions from the tutor as they arise, unlike when you just buy a kit. It has been a while since I have posted anything, my blog seems to go like that, I try to post on a regular basis but things happen and all my good intentions go out the window. Well anyway, we all entered in the Royal Adelaide show and I am please to say that this year we all managed to pick up a prize. 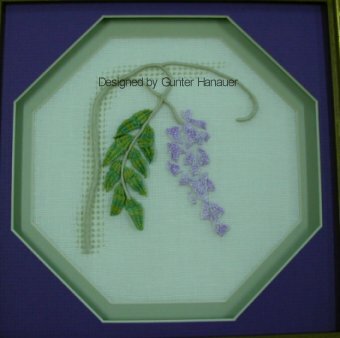 Gunter got a 3rd for his Wisteria, Monika a 2nd for her Beaded Lace and I got a 2nd for my Stump work blossoms. Apparently the entries at the Show are up this year, so go and check them out. Sorry that I have not posted anything lately but it has been all go, I have been picked as the profiled Teacher for the month at the Embroiderers’ Guild of South Australia. This means that I had to get a collection of my work together for display at the Guild, with accompanying descriptions. Also there will be a write up about me in the guild review, with pictures. So if you happen to be in Adelaide between now and mid July you can go to the Guild and see my work, plus pieces from the Guild museum and the stitch group that is displaying for that month. If you don’t have the time to go to a class but you have always wanted to learn Hardanger, here is the class you have been waiting for. 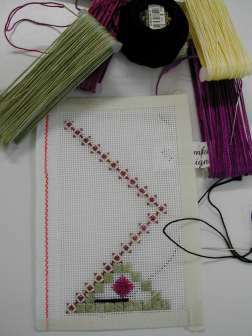 I will be teaching a cyber class in beginners Hardanger for the Embroiderers’ Guild of South Australia in June. The project will be a Scissor fob and Needlecase and between the 2 projects you will learn all the basic stitches of Hardanger and some nice filling stitches as well. 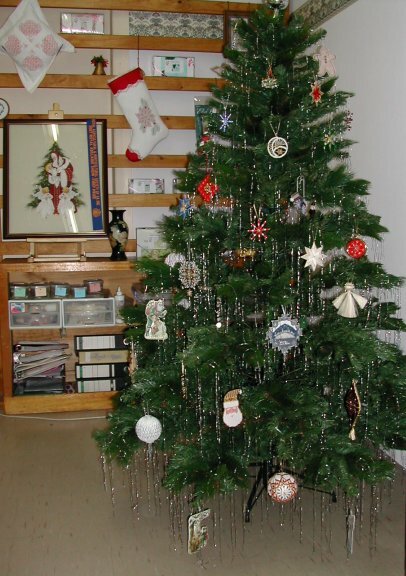 Also the project is small enough that you will easily finish it in the time allowed for the class which is 2 months. For those of you who have never done a cyber class before and you feel you would like to join one, or if you feel you would like to join, go to the Embroiderers Guild web site at www.embguildsa.org.au and check out the class information. 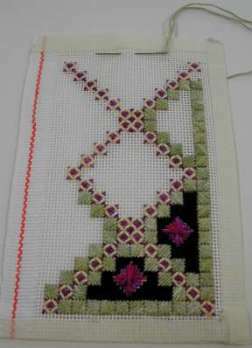 My Silk Ribbon biscornu has just been published in the Embroidery and Cross Stitch magazine 18_9, and there are 2 slight errors in the instructions. First in the ingredients list it asks for 3 x 3mm crystals, these are used for the buttons to pull in the middle of the biscornu and you only need 2. Then in the construction notes they have moved one of the dots on the diagram so below is the correction. I apologize for the errors but unfortunately we do not get to proof read the notes or check any diagrams, so any errors that occur in the publishing process we are not aware of until we get our copy of the magazine. If you ever have any queries re any of our published projects we would love to hear from you. Well Easter has come and gone and we had a great break and recharged our batteries. We have just heard from Kacoonda threads that she is changing her colour numbers, I will post the new / old numbers as we get them (and I get a chance to up load them) and also post the new Kacoonda colour card as we get them.There will be one for the Silk threads and Ribbons and one for the Wools and Mohair. 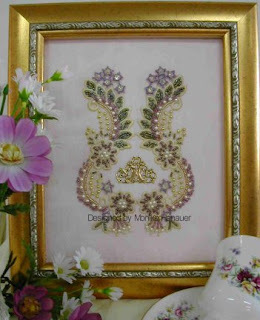 Well, here we are its already Easter again, hope you have all your stitching requirements organized. We 3 from Primke Designs actually take a break from stitching during our mini holiday, for us it will be gardening, cooking etc that will take up our time. We are also going to Meadows for their big Easter Fair, driving via the Adelaide hills with the all their Autumn colours, it will hopefully inspire many embroideries in the future and perhaps even some new colours for our Primke threads or linen fabrics. So from us 3 at Primke designs we hope you have a Safe and Happy Easter with lots of chocolate and stitching. I thought you would be interested to see what Gunter’s version of my phone pocket looks like. 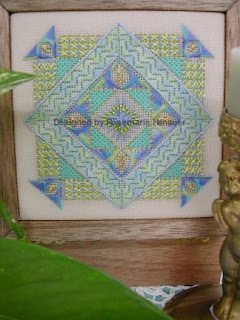 He again used Pimke perle 5 threads but in blues and greens with the same yellow as I used, but it has come out with a different feel to mine. What do you think? I just thought I would show you how the phone pocket is growing, I have been busy and not had much time to stitch but it is growing slowly. 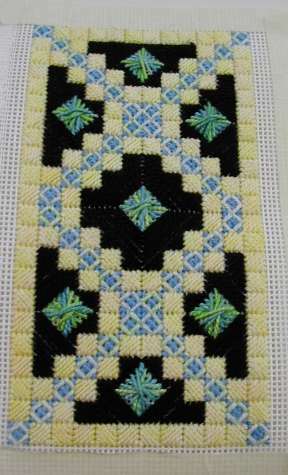 I have found a problem with the original pattern and have changed it for the one Gunter is stitching, he is using different Primke colours, I will post a picture when he has stitched a bit more. 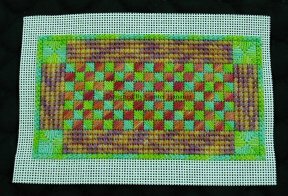 Also I am experimenting with different stitches for the black background, the bottom is tent and the other is more of a basket weave. 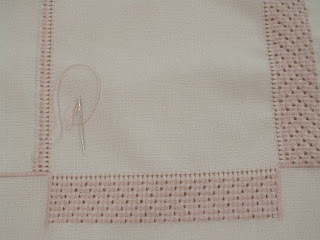 I might try something else for the next one, as I am keeping this I don't mind different stitches. I have just had to buy a new Mobile and as the last one died due to being knocked about, I have decided that to solve the problem I would stitch my self a phone pouch. I have picked bright colours so I can find it in the dark recesses of my bag and am working it in Needlepoint so it will grow quickly. This is what I have done so far, trying out the threads most of which are Perle 5 from Primke Designs, while the back ground will be in DMC black perle 5. Do let me know if you like the colours and stitches I have used. 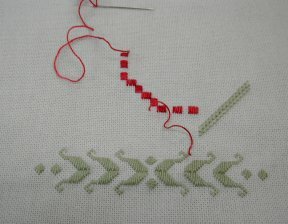 This is my first post, I hope to post interesting things for you about the needlework scene in general as well as what we are doing as designers. Plus hints and things, if you have any suggestions or questions please leave me a message. 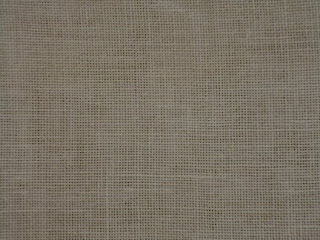 We have just heard from our Australian supplier of Zweigart needlework fabrics that Ann Cloth is now only available in White. 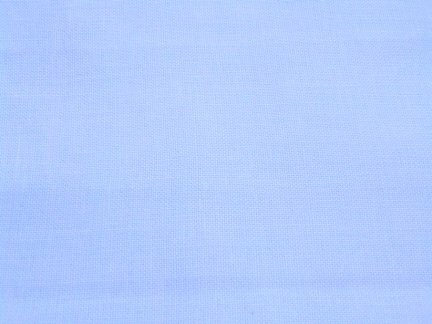 Also Congress cloth which is a very fine canvas is no longer being made, there are also other fabrics and colours that have been deleted. So if you have a particular project in mind I suggest checking with your favorite needlework shop soon to make sure you can still get what you want.